Cardelle Fergusson is a multi-talented Caribbean National with a passion for entrepreneurship and youth development in general. Currently she dedicates much of her time and attention to working with and supporting businesses and entrepreneurs in various aspects of business development and training. Cardelle’s passion for youth development came from her involvement with youth organizations, like the Duke of Edinburg’s Award programme, CARICOM Youths and Youth Ambassadors, as well as her training and experience as a certified teacher (specializing in mathematics education). 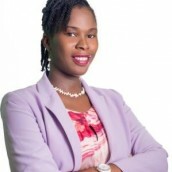 She has further achievement of a Bachelor of Science degree with honours in Computer Science and Management from the University of The West Indies in Barbados. Her studies in business are further affirmed by obtaining her designation as a Certified Management Accountant (CMA) specializing in Strategic Leadership through CMA Nova Scotia and the Caribbean. Cardelle has sharpened has skill in project management during her position as Project Coordinator for the four years IDB/MIF regional project to develop young entrepreneurs. In this post she was able to improve the activities and offerings to the Young Entrepreneurs and other stakeholders served by the BYBT while ensuring that the project was “highly relevant and fulfilled the key objectives”. Armed with a competent mix of education and experience, Cardelle is currently the General Manager at Barbados Youth Business Trust (BYBT). She has developed strategic plans by studying technological and financial opportunities; written and received approvals for proposals for partnerships, grants and projects, presenting assumptions and recommending objectives; managed staff in the execution of projects and programme activities in keeping with the company’s mandate.